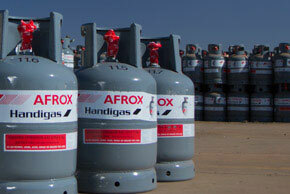 • Afrox trades on a full for empty cylinder exchange, we will also exchange LPGas cylinders from any major gas company. • We encourage you to contact the Gas & Gear to confirm stock prior to collection. • Please be aware that the Gas & Gears are currently not able to do domestic deliveries. Afrox does not accept any liability whatsoever under any circumstance for reliance of on the information provided on this site, the use of this website or any service indicates your acceptance of this disclaimer. Stock levels are correct as at last update. Cylinder exchange is subject to the customer providing Afrox with an exchangeable empty cylinder. Afrox Handigas (LPGas) is a mixture of butane and propane. It drives processes and products which range from those that that consume thousands of tons a week at industrial sites to those in which only a small amount of gas is used in the recreational arena. The ability to provide effective energy to such a broad range of applications is made possible by the wide range of cylinders and storage vessels in which Afrox Handigas can be supplied. Handigas wastes no time or energy and is the instant answer that works in and out of the kitchen. It brings welcoming warmth to dining areas during cold spells and is the energy behind the ambience, powering decorative gas flares and gas fires. Recognised for the enhanced flavours that its flame brings to a meal, Handigas is the preferred choice of chefs and hospitality outlets across Southern Africa for heating and cooking.